B to B advertising always gets sloppy seconds in the media so we're going to send some clean love to Hanft Raboy & Partners which created this interesting print campaign for its security software client Fortify Software. The print ads feature a forward looking time line highlighting less than desirable results based on a security breach. From the simpler loss of job and, as a result, having to live in one's mother's basement to full scale SkyNet-style Armageddon, the campaign, while exaggerating the extremes, clearly illustrates what can happen in a world run by computers. See all the ads here. This is just freakish but we love it. 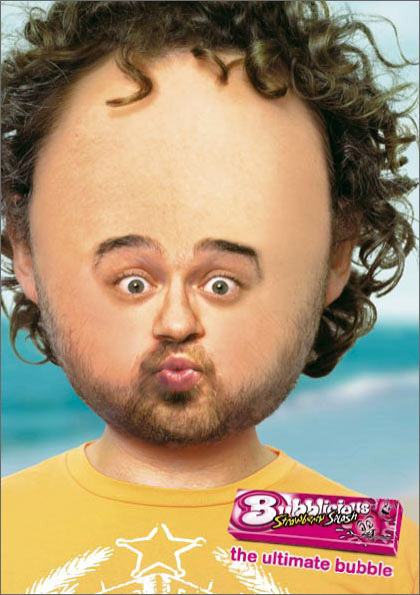 It's a campaign for Bubblicious created by Duval Guillaume in Brussells. See the other ad here. Just because the United States of America has a few perception problems in other parts of the world, doesn't mean the country should go and change it's name to something that exudes a friendlier perception. Just because everyone refers to Australia and "down under" doesn't mean the country should adopt that name. Just because Iraq caught some crap from the rest of the world, the country isn't running out to change it's name so we all think differently about it. A county's name is steeped in history and isn't something to be toyed with like a brand name but that's what Al Ries would have us believe. Because Guatemala seems to be suffering some perception problems among the rest of the world's populace who don't realize it's the center of Mayan culture as opposed to Belize, El Salvador and Mexico's Yucatan Peninsula who've co-opted the culture, Ries, aside from disliking the country's new slogan, "Soul of the Earth," thinks the country should change its name to Guatamaya. Yea, you heard that right, Guatemaya. That's like calling Australia Kangaroo. Or Brazil Bootyville. Continuing its "Brilliant" campaign, Guinness has launch a new commercial, called Dance, promoting the St. Patrick's Day season. Yes, it's a season, now, not just a day. In the ad, the famed Brewmaster's dance a rendition of an Irish step dance until it becomes too mch for the floor to withstand and they figure they're better off just drinking a Guinness. The spot kicks off this weekend on cable networks such as ESPN, USA and F/X and continues through St. Patrick's Day March 17. The "Brilliant' campaign has 11 spots in it so far, each one featuring the goofy but enjoyable-to-watch Guinness Brewmasters. The campiagn and this Cance commercial were created by BBDO New York. Apparently, Brooke Burke didn't have a non compete clause in her agreement with Burger King and Crispin Porter + Bogusky as indicated by these images of her entering and leaving a McDonald's. Or, according to a Buzznet editor, these images may simply be a twisted continuation of the Burger King Brooke Burke photo viral. The editor tells us, "The 'boink' galleries where the Brooke Burke pics are posted seem to be owned by someone who is 'in the industry' PR-wise. The person/company behind 'boink' tends to have a lot of pics that end up being widely available but they really seem to have them first. There's a couple other galleries like 'boink' at buzznet that could be the same person but are posting promotional photos of bands, etc." We'll keep you updated. Perhaps in an effort to dispel their dowdy look and to get fashion critic Richard Blackwell to lay off dissing the pair, Mary-Kate and Ashley Olsen have signed a deal with designers Mark Badgley and James Mischka to represent the label in an upcoming ad campaign. The ads, photographed by Gilles Bensimon in the Presidential Suite of the St. Regis Hotel in Manhattan,, will grace the pages of Vanity Fair, Vogue, Elle and InStyle beginning with April issues. The collection is said to be a bit more colorful then the sister's usually drab outerwear. If you want to see what a hipster really looks like or, at least, what Virgin Mobile deems to be a hipster, you can take a look at images from yesterday's photoshoot/party for an upcoming campaign. The shoot took place at Milk studios, was shot by Ryan McGinley and Ben Cho provided the tunes for ths hipsters to gyrate to as they were shot. If these are what hipsters look like, I'll take a good 'ol country girl anytime. OK, Kristin is kinda cute. UPDATE: Seems the page the link points to has been removed. We'll follow up to see where the page has been moved to. While fast forwarding through the ads in a recent episode of "The O.C.," an ad from the Office of National Drug Control Policy's National Youth Anti-Drug Media Campaign caught our attention with it's DVR-resistant, slow-cut tactic. The ad, with only four "segments" is called Smushed and is part of the Office's Above the Influence effort. Apart from catching our attention by appearing as a "still" while fast forwarding, the imagery of a girl who looked like she'd just stepped out from under an industrial compression-like machine also caused us to stop, rewind and watch the ad. The ad itself dealt with issues of peer pressure to be cool, to fit in, to drink, to get high, to be popular, to never say the wrong thing. This ad is one of six currently running on MTV, Fuse, The N, FOX, The WB, UPN and others. The online component appears on Yahoo, GameSpy, IGN and print ads appear in 23 magazines including Teen People, Skateboarder, J-14 and Playstation. The entire collection of spots, all of which are very good, and print ads can be seen here. Elizabeth Hurley is said to be the next in the long line of celebrities to appear in the American Dairy Association's Got Milk campaign according to Contact Music. In the ad, Hurley will appear a white T-shirt and bikini bottoms accompanied by copy, "Shocked Im a mom? You should know by now that milks nine essential nutrients make for one irresistible body." AdPunch has a larger image of the ad here. Today, GE has launched the online component of its Healthcare Re-Imagined campaign currently running during the Olympics. The company has published a podcast with Judy Hu, GE's global executive director of Advertising & Branding and Jen Walsh, GE's director of digital media in which Judy describes the thought process behind the campaign and Jen explains why the online medium is so important to GE's healthcare focus. In the podcast, Judy explains the company chose to go with a more serious tone in the campaign as research found humor didn't play well with healthcare topics and Jen explains the online component which includes a Yahoo page takeover February 14 and 15, videos on Webshots and AOL.com and a local language International roll out.